LIST OF UFC EVENTS – UFC 235: JONES VS SMITH TICKETS HERE!! So we are actually going to see Jon Jones fight so soon after his UFC232 win? Well this is a treat to see Jones back so quickly so I’m really grateful as an MMA fan to see one of the greatest back in the cage. Its going to be an interesting bout against Anthony Smith, as Smith has been devastating since moving up to 205 so its gona be interesting to see how he can do against the mighty Jon Jones in a UFC Light Heavyweight title bout. Also in the co-main event we have Tyron Woodley defending his UFC Welterweight title against the rising star of Kamaru Usman, there is also even more amazing fights on the card, so read the full analysis right HERE! Want a ticket right now? Well then you can get what you need on this cool ticket site. LIST OF UFC EVENTS – UFC 234: WHITTAKER VS GASTELUM TICKETS HERE!! So whats the best fight card of February? Well you have to go with UFC 234, because Robert Whittaker vs Kelvin Gastelum for the UFC Middleweight title is worth the ticket price alone – but with Anderson Silva vs Israle Adesanya also on the card then this event really could be a classic down under! Get the full fight breakdown HERE. Or if you literally need a ticket now then you can get booking the tickets you need on this excellent ticket booking website! LIST OF BELLATOR EVENTS – BELLATOR 214: FEDOR VS BADER TICKETS HERE!! If you feel the same way as me about Fedor Emelianenko then you know its a treat to see him compete anytime – I am so excited to see him fight but when he is past his prime and facing a powerful and well in his prime Ryan Bader this is one I have to see and every big MMA fan should! Or if you need a ticket right now and don’t have time to read the fight breakdown then you can book a tick on this ticket booking site! LIST OF UFC EVENTS – UFC 232: JONES VS GUSTAFSSON 2 TICKETS HERE!! It was arguably the best UFC Light heavyweight title bout that we have ever seen when Jon Jones fought Alexander Gustafsson at UFC 165 back in 2013 and this has to be easily one of the most sought after rematches that all MMA fans want to see again. Jon Jones has been in the headlines mainly for the wrong reasons in recent years, but the man is a Goliath and absolute destruction expert in the cage who will go down as one of, if not the greatest Light Heavyweight or even MMA fighter of all time. This rematch at UFC 232 just before the turn of the year is a real treat for us all! So for a full breakdown of the whole card then you can go HERE. Or if you need a ticket right this moment, then you can make a booking right now on one of the best Ticket Auctioning websites! LIST OF UFC EVENTS – UFC 231: HOLLOWAY VS ORTEGA TICKETS HERE!! I always say better late then never with anything in life, but that always true in the fight game and at UFC 231 in Canada we will see Max “Blessed” Holloway go up against undefeated Brian “T-City” Ortega for the UFC Featherweight title. This fight should have happened back at UFC 226, so I’m glad we are getting the fight now – got a feeling this fight card is going to be one filled with entertaining fights! We break the whole event down right HERE. But also if you don’t have time for much reading and you need a ticket for this event now, then you can do that in this hotspot for tickets! LIST OF UFC EVENTS – UFC 230: CORMIER VS LEWIS TICKETS HERE!! We thought it would be Nate Diaz vs Dustin Poirier, we thought it could be for a new 165 pound championship. But we were wrong, after this fight got cancelled due to Poirier getting injured it was clear we would need a something BIG to step in its shoes. Well it doesn’t get any bigger then this! The legendary Daniel Cormier will put his UFC Heavyweight title on the line as he squares off against the streaking devastating Derrick Lewis! This is not gona be one to miss! So look over the whole card so far right HERE. If you need to book a ticket immediately, then you can get that done on this ticket website. LIST OF UFC EVENTS – UFC 229: KHABIB VS MCGREGOR TICKETS HERE!! The return of The Notorious Conor McGregor is set in stone, and it will be against the undefeated and current UFC Lightweight champion in the Eagle Khabib Nurmagomedov. Conor was stripped of his UFC Lightweight and Featherweight titles due to inactivity and his part in the New York bus incident at UFC 223. Also Tony Ferguson vs Anthony Pettis has been added to the card so this is gona be an amazing event, look here for the full fight card breakdown. Or you can book a ticket right now at one of the top ticket booking websites. LIST OF UFC EVENTS – UFC 228: WOODLEY VS TILL TICKETS HERE!! This is one of the best title fights coming up in the rest of the 2018 schedule – The fast rising highly talneted Darren Till will attempt to dethrone the powerful current UFC Welytwerweight champion in Tyron Woodley! Look at the full event analysis HERE. If you need a ticket right now then you can get what you need at one the best ticket booking websites. LIST OF UFC EVENTS – UFC 227: DILLASHAW VS GARBRANDT II TICKETS HERE!! Now this is a blazing rematch right here, as current Bantamweight champion T.J. Dillashaw takes on the ferocious striker Cody Garbrandt for the second time. The first fight was fast paced and brutal and expect noi different here, so make sure you get to see it LIVE! See the full fight card breakdown right HERE. LIST OF UFC EVENTS – UFC 226: CORMIER VS MIOCIC TICKETS HERE!! This easily the BIGGEST event of the year so far as we will see UFC Light Heavyweight champion Daniel Cormier taking on current UFC Heavyweight champion Stipe Miocic at the T-Mobile Arena in good old Las Vegas! Don’t miss it! Get the full event analysis right HERE. Or is you need tickets right now then check out my best places for getting tickets. LIST OF UFC EVENTS – UFC 225: WHITTAKER VS ROMERO II TICKETS HERE!! On June 9th the UFC rolls into Chicago to watch one of the most anticipated rematches in MMA as the current UFC Middleweight champion Robert Whittaker takes on Yoel Romero at the United Center and I’m so pumped for this one! If you want a full breakdown of the fights and the whole event then look HERE. Or if you cant wait to book a seat, then you can make a direct booking on my top website for buying tickets. LIST OF UFC EVENTS – UFC 223: FERGUSON VS NURMAGOMEDOV TICKETS HERE!! On April 7th we have one of the most anticipated Lightweight bouts in history as the undefeated in his last 12 fights Tony “ElCucuy” Ferguson takes on the undefeated 25-0 Khabib “The Eagle” Nurmagomedov at the Barclays Center in Brooklyn, New York. To read about the whole fight card then click right HERE. Or if you need a ticket right now then you can look at all the seating plans and book yourself a seat on this TOP CLASS ticket website. LIST OF UFC EVENTS – UFC 222: HOLLOWAY VS EDGAR TICKETS HERE!! So on March 3rd we have a nice fight card to look forward to as UFC Featherweight champion Max “Blessed” Holloway riding a 12 fight win streak takes on former UFC Lightweight champion Frankie Edgar at the T-Mobile Arena in Las Vegas, Nevada. If you wana read about about the whole fight card then click right HERE. Or if you want to just looking at seating plans and book a ticket right now, then you can do that on this excellent ticket website. LIST OF UFC EVENTS – UFC 220: MIOCIC VS NGANNOU TICKETS HERE!! Look its important to start any new year with a big BANG! And boy oh boy it doesn’t get any bigger then the UFC Heavyweight title clash between champion Stipe Miocic and the fearsome number 1 contender in Francis “The Predator” Ngannou at the TD Garden, Boston, MA. Read about the whole fight card right HERE. Or if you need a ticket right now, then you can make a direct booking on my top rated booking site. LIST OF UFC EVENTS – UFC 219: HOLM VS CYBORG TICKETS HERE!! All MMA fans are in for a big end of year treat as “The Preachers daughter” Holly Holm, goes head to head with the dominant Cris Cyborg at UFC 219, at the T-Mobile arena in good old Las Vegas, Nevada on Saturday December 30th. Read our full breakdown of the event and ticket information in this post. Or if you just want to book a ticket right now for this historic event, so you can pick from the best seats, then you can do that right HERE. LIST OF UFC EVENTS – UFC 218: HOLLOWAY VS EDGAR TICKETS HERE!! Detroit is still the rock city for me, and when the UFC come to town that is always the case! So you should get yourself down to Little Caesers Arena, in Detroit, Michigan on Saturday 2nd December for this amazing UFC 218 card! You can read about the whole fight card right HERE. Or if your ready to book a ticket right now, then you can do that directly on the best ticket booking website that I use. LIST OF UFC EVENTS – UFC 217: ST. PIERRE VS BISPING TICKETS HERE!! I want o be a part of it New York, New York! You should be a part of it too at UFC 217: St. Pierre vs Bisping at the famous Madison Square Garden on Saturday 4th November. Read all about it in my review. Or if you want to book a ticket right now, then you can do that at my favourite ticket booking website right HERE. LIST OF UFC EVENTS – UFC 216: FERGUSON VS LEE TICKETS HERE!! I love Las Vegas, especially if theres a good fight to watch while I’m there and on Saturday the 7th October at the famous T-Mobile Arena, we will be watching “El Cucuuy” Tony Ferguson go up against “The Motown Phenom” Kevin Lee. Or if you want to go directly to booking your ticket then you can do so right HERE. UFC 215: DEMETRIOUS JOHNSON VS RAY BORG TICKETS HERE!! Have you been to Canada before? Well its an awesome country and either way if you have some free time you should go and see this stacked UFC 215 card, at Rogers Place in Edmonton. We will all bear witness as Demetrious Johnson looks to complete the most UFC title defences in UFC history with 11 against the hot prospect in Ray Borg. You read about the whole card in my breakdown. Or if you just need to book a ticket directly now, then you can do that right HERE. CONOR MCGREGOR VS FLOYD MAYWEATHER TICKETS HERE!! This is one for the history books, because we have never seen such a high calibre clashing of two different combat sports worlds before. 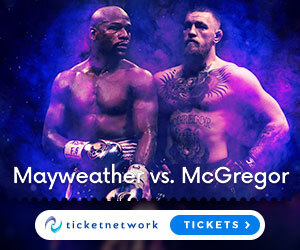 I will be in Las Vegas on August 26th to see this fight live at the T-Mobile Arena, and I want you to be able to join me, so read all about it in my post. Or if your ready to looking at the seating plans and book your seat, then go straight to the TicketNetwork. UFC 214: CORMIER VS JONES II TICKETS HERE!!! Many UFC fans have been waiting for this rematch more then any rematch in UFC history, and I am definitely super excited for this one! Read all about it right HERE. Or if you want to book a ticket right now then you can do that at my favourite ticket booking website. UFC 213: GARBRANDT VS DILLASHAW TICKETS HERE!!! The T-Mobile arena in good old Las Vegas will host one of the top UFC cards of 2017 when UFC 213 rolls into town on July 8th. Cody Garbrandt and T.J. Dillashaw have a heated rivalry which will be the main event for this card and you read all the details in my post. Or you can make direct bookings right HERE. BELLATOR 180 NYC TICKETS HERE!!! Bellator are stepping into the big leagues for the first time, with their first card from MSG in NYC on June 24th for Bellator 180. Its a stacked card for Bellator, so read about it and tickets right HERE. Or if you want to start booking tickets right now you can do that on my favourite ticket network. UFC 211: MIOCIC VS DOS SANTOS 2 TICKETS HERE!!! If your wondering what card I’m most looking forward to the most this year, it is currently UFC 211 at the American Airlines Center, in Dallas, Texas on May 13th. Its a stacked card and I really can’t wait, so you can read all the details in my latest article. The Sprint Center in Kansas City, Missouri is going to be rocking on April 15th as the UFC comes storming into centre stage for a great night of action, this looks set to be the best Fox card EVER! You can read all about it right in my post. Saturday 18th March, at the O2 arena in London England will be rocking as the UFC rolls in with a massive fight night card that’s sure to excite Read my post below, or here. List of UFC Events – UFC Fight Night London: Anderson vs Manuwa Tickets Here!! UFC 209: WOODLEY VS THOMPSON 2 TICKETS HERE!! Saturday 4th March in the T-Mobile Arena, Paradise, Las Vegas Nevada there is going to be fireworks when we get to see the much anticipated rematch Between Tyron Woodley and Stephen Thompson – You can read my post for more info HERE. On Saturday January 28th, at the EventCity arena in Manchester, you will be able to meet Conor McGregor live and in person, as well as being treated to a night of great food, drinks, music and services – to get more information on this event then read my post HERE. Or if your ready to book your ticket to this event right now, then you can that right HERE. On November 19th at the SSE Arena in Belfast Northern Ireland, you will be able to watch a phenomenal fight card live and in the flesh, so for more information click HERE.